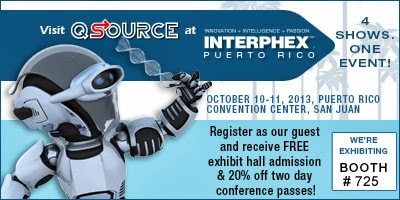 The INTERPHEX Puerto Rico (PR) 2013 tradeshow will be held October 10-11, 2013, at the Puerto Rico Convention Center in San Juan, Puerto Rico. Q Source has been an annual participant at the show and once again will be in attendance exhibiting at Booth 725 and offering a special discount to our guests (details below). INTERPHEX PR is a leading tradeshow focusing on the pharmaceutical and biotech manufacturing industries. The event features more than 200 exhibitors, keynote topics, and several educational programs. Attendees/visitors are exposed to displays of the latest technological products, services, and equipment for processing, maintenance, packaging, and more. The two-day event (1:00 – 8:00 p.m. on 10/10 and 1:00 – 7:00 p.m. on 10/11) will kick off each day with a featured presentation. On Thursday the 10th, Myriam Sosa, the Site Quality Head for Novartis Ex-Lax, will deliver the keynote, "Pre-approval Inspections and How to be Prepared for the Audit" from 10:00 – 11:00 a.m. On Friday the 11th, George Bandy, Jr. of Interface, Herminio Bosques of Merck, Karen Butterfield of Sun Power Corporation, Jorge Quintana of Johnson Controls, Inc., and Harry Rodriguez of PREPA will present "Business Innovation through Practical Energy and Supply Chain Management Strategies" from 10:00 – 11:00 a.m. For more information about INTERPHEX PR 2013's educational speakers please follow the link. As with last year's event, INTERPHEX PR 2013 is actually four shows in one: INTERPHEX Puerto Rico, BUILDINGS & FACILITIES Puerto Rico, MEDICAL DEVICE Puerto Rico and Latin American Supply Chain. Each show features a specific educational path and exhibits of the latest technological innovations to boost productivity and efficiency. If you’re someone who is tasked with recommending, specifying, or purchasing packaging, manufacturing, operational equipment, or products for your company, this is a can’t-miss tradeshow. At INTERPHEX PR 2011, Q Source debuted its modern full-size display booth and at INTERPHEX PR 2012 we invited you to be our guests. We're looking forward to the 2013 show being an even bigger success and we're inviting you once again this year to be our guest and receive a FREE exhibit hall admission & 20% off a two day conference pass. All you have to do is follow the link to register for the show. And remember, don’t forget to stop by our exhibit at Booth 725 to say hello, speak with our experts, and pick up a goodie bag. For additional information about INTERPHEX PR 2013, you can visit their Web site, read their official INTERPHEX blog, and view a map of the show floor. The Q Source Resource will also provide news as it becomes available and will follow-up with a post-show update. If there's topic you'd like to see The Q Source Resource write about please let us know. We'd also appreciate if you share our blog posts with your friends and colleagues via the social media links below. If you have questions or comments about INTERPHEX PR 2013 please leave us a message in the comments section.